George Dowdle farms Green Gables oysters on Southwest River of Prince Edward Island. The island has a strong, locally sourced sea-to-table community where chefs know and work with farmers, growers, and fishermen. Many people are familiar with Malpeque oysters, a term that originally referred to the bay where these bivalves are grown, now often used as a generic term for any oyster from the island. In multiple visits to PEI — for the Canadian National Shucking Competition in July and the Shellfish Festival in September — I reached out to farmers and others to learn more about the industry. On a sunny morning I boarded small boat in New London Bay, on the north-central coast, and tooled along the Southwest River to where George Dowdle grows his Green Gables oysters. After farming for 37 years, the burly and affable Dowdle — along with his wife, Marlene — is more than familiar with the oyster business. He often ferries chefs to the farm to get direct feedback about what they want, and also just for the fun of it. “We’re a single-source operation,” said Dowdle, meaning his oysters are grown from seed to finish in the same area. Dowdle grows his oysters in bags that hang in the water, allowing crabs to eat little mussel seeds that accumulate. His plump, briny bivalves have a sweet finish because of nearby bubbling cold artesian springs where his product spends a few days before shipping to market. The farm produced 4,000 cases of oysters last year, and Dowdle hopes to increase his yield in the coming year. “At one time, the area around Biddeford was the epicenter of oysters. Now every little nook and cranny, every inlet and bay, has huge amounts of them,” said Dowdle. He pointed across the water to areas where other growers place bags of almost fully grown oysters for a week or two in order to brand them with a fictitious name of a point or cove — the opposite of a single-bed operation. I admit it: I was shocked by this oyster sleight of hand. (Then again, all the bivalves I’ve slurped from the island are salty and crisp, and I wouldn’t pass one by.) Dowdle shucked a few of his tasty offerings for me — from sea to mouth are the best! — and I also sampled his Green Gables oysters at Sims Corner Steakhouse & Oyster Bar, a classic steakhouse in a historic brick building in downtown Charlottetown. Colville Bay oysters are also sought out by local chefs and aficionados. Johnnie Flynn, along with his brother Leo, son Thomas, and three nephews, farms 30 acres of oysters near where he grew up along the island’s eastern shoreline. “I farmed lobsters in spring and fished for cod in summer and fall. 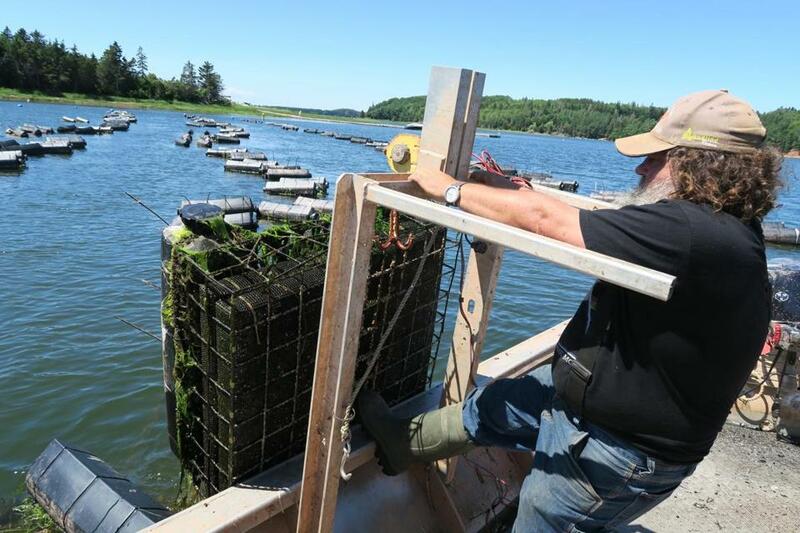 In the early 1990s, cod stocks were running low, and we started our oyster farm,” said Flynn. His oysters are grown on the beach at the low-tide line — in bags to keep predators out — for about two years, and then are spread across the bottom in deeper waters. Algae in the water combined with the brisk current creates the Colville Bay oysters’ distinctive aqua-green shells and their salty-sweet flavor. “There’s a Chinese saying, ‘The ox is slow but the earth is patient.’ I remember reading that and thinking it works for oysters. They’re not something you can rush,” said Flynn. In 2014, Flynn and his family opened the Lobster Shack along the boardwalk at Souris Beach. Modeled after mom-and-pop operations encountered on a road trip in the United States, Flynn’s one-room restaurant and market serves lobsters, clams, lobster rolls and platters, and freshly shucked Colville Bay oysters. Shaded picnic tables overlook the beach, where one can gaze across the water at the flats where the oysters are grown. On this relatively small crescent-shaped island — about 174 miles from tip to tip — there are dozens and dozens of spots serving oysters from family-owned beds. Some of my favorites include Carr’s, a family-run casual place overlooking the Stanley River that serves oysters from its own beds (also home to swoon-worthy lobster rolls); Malpeque Oyster Barn, located at the far end of a scenic north coast road leading to Malpeque Bay (also serving bowls of succulent mussels); and the Claddaugh Oyster House in downtown Charlottetown, an upscale eatery that shucks a changing selection at its oyster bar. To taste a variety of the island’s culinary offerings, it is worth reserving a seat at The Feast, a multicourse meal served at the Inn at Bay Fortune. The inn and its kitchen are owned and operated by chef Smith, and the menu — changing daily — includes an all-you-can-slurp Oyster Hour, appetizers such as hot salmon from the outdoor smokehouse, and a family-style meal (served at long butcher-block tables) that showcases island meats, seafood, and produce from the organic farm and herb gardens.